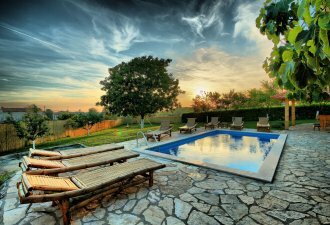 This luxurious villa with pool for 12 persons is located in the village Radetici in the surroundings of Sveti Lovrec, 21 km from Porec, and 29 km from Rovinj. The house has been built in the year 1912 and completely renovated 100 years later - in the year 2012. It consists of two buildings located on an own ground of 1.700 sqm. The house is furnished with attractive rustic furniture, it has an outdoor swimming pool of 45 sqm with plenty outdoor space with two terraces and an outdoor kitchen with grill. Villa for 12 persons with in total 200 sqm – consists of two buildings. The larger house (semi-detached) consists of a ground floor with a spacious living-dining room furnished with luxurious furniture and open fireplace, kitchen and table with chairs – all in the same room, toilet. From the living room there's exit to a spacious covered terrace with sitting set and an additional terrace with a large table for 12 persons and an outdoor kitchen. At the first floor there are in total 4 double bedrooms with french beds, two of them with shower/toilet and three with balcony, bath/toilet in the hall. In the second building (detached) at the ground floor there's a playroom with a billiard table, darts, kitchenette and a toilet. In the other room at the ground floor there's a sauna and a home trainer. At the first floor (attic) there are two double bedrooms with french bed, each with shower/toilet, one with a small balcony.